Christi's Creative Crew: Hope You Are Having COOL Summer! Each time I used the pocket stamp and die but let's not forget about the other super fun elements in this bundle. 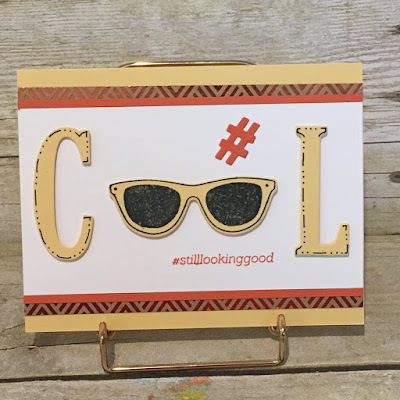 This card (inspired by Mary Brown) is super "COOL"
Yes, I will confess that I used a couple retired products because I did not have the one that Mary used. The hash tag is a die from LITTLE NUMBERS DIES and the stamp is from @SOSOCIAL. I think that it would be super cute to add a little rhinestone on the sunglasses to give them a little bling. Just click on any of the supplies to shop with me! Don't forget to use the HOSTESS CODE when checking out. This code will be good through 5pm today (August 31st) There will be a new Hostess Code tomorrow.